No matter how hard we try, we never seem to get everything exactly right. Many feel frustrated they didn’t do better or judge others who fall short. But have we failed if we aren’t perfect? 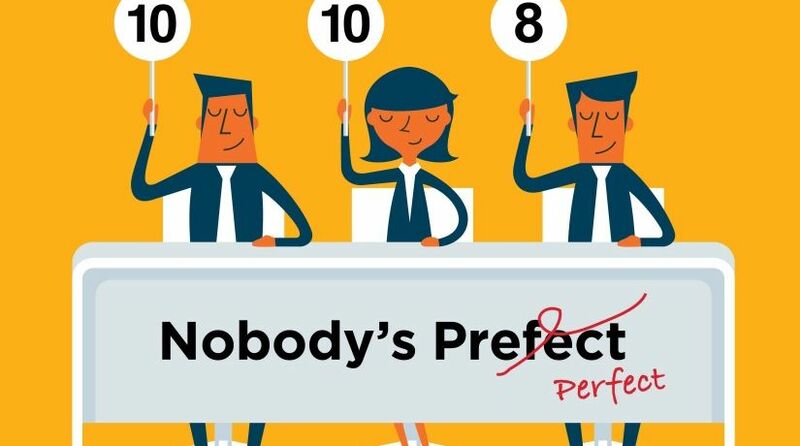 You’d think that perfectionists would be more successful and productive than anyone else. After all, their personal standard and expectation is to be flawless. You might also think they would be the kind of people you’d want to hang out with in hopes that their demand for the highest quality would encourage you to strive to do better. But it turns out that perfectionism can be a serious handicap. And those with the trait are often frustrated and unhappy, making life difficult for themselves and for those around them. Clearly, aiming for perfection can motivate us to work harder, do better or accomplish more than we otherwise might. But maybe there’s also a time to let it be and let go. Many books have been written on the subject. Even a quick search on the Internet reveals scores of articles on perfectionism written by psychologists and mental health professionals. Experts agree and our own experience teaches us: Perfection is an unattainable illusion. Its negative effects on life can be easy to recognize, yet difficult to deal with. The tendency often begins in children when their parents push them to do better in school or in sports, sincerely meaning to teach them to be their best. What it often really teaches is that their best isn’t good enough, so they have to try even harder in their attempts to satisfy others. And, besides, no matter how good you are at something, there’s always someone else who is better. If we think it through, we realize that it’s impossible to do something so well that it couldn’t be improved. The concept of perfection is kind of like a mirage—it’s a tantalizing illusion we think we see in the distance. We try desperately to get there, but it always out of reach. It’s easy to chain ourselves to unrealistic goals and then punish ourselves for not reaching them. There are a couple of different varieties of perfectionists. Some people are covert, hiding their obsessive desire to be flawless. Others are overt, making no secret of their insistence that mistakes are simply not acceptable. In either case there are many symptoms. Are highly critical of the best efforts of others—which, in reality, can be a symptom of your own dissatisfaction with yourself. Resist helpful input or constructive criticism. Don’t enjoy a sense of accomplishment when you complete a task because all you can see are the flaws and shortcomings. What if, after we have done our very best, the result isn’t impeccable? What if there is still room for improvement? Actually that can be a very good thing because we can be satisfied with the result, yet be motivated to remain diligent. “Striving for excellence” is a common phrase used to describe the standard and the best efforts of individuals or organizations. The phrase means you’re putting full effort into whatever you are doing to produce the highest value. The word excellence means “the quality of being outstanding or extremely good.” The implication is that the result is exemplary, but still leaves room for improvement. It also implies that the result is a satisfactory one. Excellence is attainable because it is accomplished when we do the best that is possible. After all, “our best” is all that is ever possible. But that doesn’t mean that we settle for an inferior effort or result. The phrase near enough is good enough can be an excuse for being sloppy and lazy. But “near enough” is good enough when you’ve done the best you can. We all have limits. When we accept that we’ve done our best, we can take satisfaction and move on. So far, we have looked mainly at physical aspects of our lives, some of which demand excellence and others of which are not so important. We have to prioritize which areas to give the most effort. But what about the spiritual aspects of our lives? There’s another standard of perfection that is more important. What does God expect of us in terms of our obedience to Him? Isn’t sin the failure to be absolutely obedient? Has God set an impossible standard for us to meet? Or does God’s grace relieve us of all responsibility to obey His law? The only human who never sinned was Jesus Christ (Hebrews 4:15). He lived a flawless life, completely innocent of any sin. We’re exhorted to follow His example, to live as He did (1 Peter 2:21-22; 1 John 2:6), but it’s obvious that we cannot be sinless as He was (1 John 1:8). Just because we can’t live perfectly (without sin) doesn’t mean we’re good enough as we are or that we aren’t supposed to continue to make the effort to obey. When we acknowledge and repent of sin, God will forgive us (1 John 1:9). But we are not to continue in sin just because God is merciful and gracious (Romans 6:1-2). Paul’s exasperated description of his battle against his own nature stands as a classic description of our own struggle to faithfully and consistently obey God (Romans 7:14-25). In Proverbs 24:16 we read, “For a righteous man may fall seven times and rise again, but the wicked shall fall by calamity.” It’s clear that even a righteous person will make mistakes, but he stands up again every time he falls—he repents of his sin, seeks to be forgiven and continues his effort to be obedient. Even as we continue to put our full effort into being holy as God is holy, at times we struggle and stumble. God expects us to struggle against our natural inclination to sin, to live obediently according to His holy standard (1 Peter 1:13-16). God uses our inherent imperfection to teach us one of the most important lessons of life. If we could be sinless by our own efforts, it would ruin us because we would depend on ourselves and conclude that we could earn God’s salvation. In effect, we might think we didn’t need a Savior. In fact, even if we could live without sin from this moment forward, there would still be all those sins in our past that would still need to be forgiven. So we learn to rely on God’s grace and mercy, which He extends to those who genuinely repent (1 John 1:9). Our ongoing effort to be obedient won’t result in our becoming flawless people. But it can produce people who are humble, determined, stable and mature. So what is the meaning of Hebrews 6:1, which says, “Therefore, leaving the discussion of the elementary principles of Christ, let us go on to perfection”? And what about Jesus’ statement in the Sermon on the Mount: “Therefore you shall be perfect, just as your Father in heaven is perfect” (Matthew 5:48)? The words perfection and perfect in those two verses are translated from Greek words that refer to something that has been brought to completion, fully grown or mature (Vine’s Expository Dictionary of New Testament Words). In other words, these passages tell us we are to grow up spiritually, to become mature and to complete God’s purpose in our lives. It is not a command to become flawless, completely free from sin. As we’ve already seen, that is not possible for any person. The lesson is that through a consistent effort to obey, we are trained to separate right from wrong—we become spiritually mature. So it’s clear that in the New Testament perfection refers to being fully developed and spiritually mature. We must not compromise or take a “near enough is good enough” approach. Careful obedience to God’s law is necessary. We are to strive for excellence in our relationship with Him. The human condition is one of imperfection. There isn’t anything we can do in this life that meets the English dictionary definition of perfect: “being entirely without fault or defect.” It’s important to learn to be satisfied with the excellent results that can come from giving our best efforts. As Pope implies in his poem, we can learn about forgiveness from God—recognizing that we make mistakes just like everyone else, so we shouldn’t judge each other harshly. But God’s standard and expectation are different. He is faithful to forgive our sinful shortcomings. He teaches us that as we strive to live obediently, we will fall short at times. But through those efforts we can become mature and complete as we move on to perfection with His help.